Located above Livingston Bay, east of Evans Pass. Routes may be longer than 25 metres! The 50m rope from the the rap anchors may not get you back to the ground. Approach from the top. Take an extra rope to rap in, and ascenders/prussicks to exit the top of the climbs to safe ground. The bottom of the crag is also steep, please exercise a bit of steep country sense. Use same car park for Jane Fonda W/o Wall. Drive to Evans Pass on the Summit Road, and drive 3km towards Godley Head. Park in a layby directly above Taylor's Mistake. 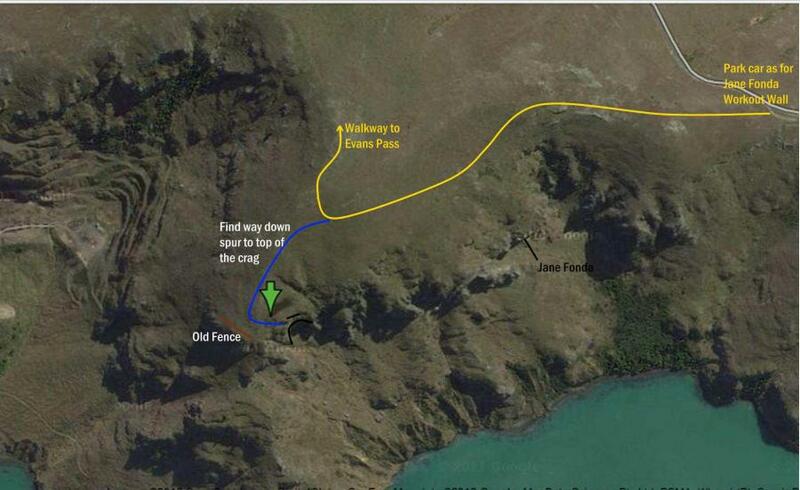 Walk west along Crater Rim Walkway (towards Lyttleton). Cross stile and contour west, to obvious hairpin bend. At hairpin, walk straight off end of bend onto the spur and carry on to a large block. Descend from block down the spur to a fence line, and top of gully ( with a broadleaf). Traverse back east tending slightly downhill under a small rock buttress to a narrow grassy ledge. At the ledge there should be some bolts to set up your rap rope & gear up. A straight abseil will take you down a long corner, this climb is "Night Moves"
Start just left of ‘Fragile’. Start directly below the first bolt. Climb up to the wall to the left trending feature, make some awkward moves to gain a shallow corner. Climb straight up past the last bolt and traverse delicately right and up to the chain belay of ‘Fragile’. Traverse round to the right of the crag past a flax bush to the foot of wall, black and slabby at the right hand side. Start directly below the first bolt. Climb up to the shallow niche and exit slightly leftwards at the top. Continue straight up to a chain belay. Takes a line up the left side of the buttress starting down and left of the belay chain at the foot of “Gas Guzzler” Start lower than ‘Gas Guzzler’ and just left of a vague crack/groove system. Climb the black wall left of the groove system on good holds. An awkward move at half height gets you to the foot of the groove (as for GG). Climb the left side of the groove to the roof, exit up the left side of the roof to a belay on the right. You can clip the first bolt on GG if necessary. Gas Guzzler takes a line on the right side of the buttress; start just right of the belay chain. Climb the yellow tinted wall on good holds to a large hole; continue straight up to the groove, climb the right side of the groove to the roof, exit up the right side of the roof to a belay on the left. Initially climbed in the dark, a route that has everything. Start up an easy slabby wall and continue up the corner. Climb the ever-steepening corner till it becomes a chimney. Carry on up the chimney till you reach vegetation and a bolt on the right wall. Swing out onto the face of right wall and move up to a belay on a ledge. Starts as for ‘NM’, after the first bolt move right and into the obvious open groove. Climb the steepening groove till it gives out continue up the upper wall to the belay of ‘NM’. Start at toe of butress, climb daigonally right to foot of large prow. Climb the weakness in the wall 3m left of the prow. Start as for “BOF” at the first bolt move left onto the arête and climb it to the last bolt of “BOF”, move out right and up to a DBB. Start as for FLF to the 6th bolt, then go round right under the nose to the base of a corner. Bridge up the corner to the 5th bolt before moving out on to the left wall and up to a DBB. Start just right of “BOF”, climb the wall technically until you get to the 5th bolt. Step left and bridge up the corner to the before moving left wall to the DBB of “BOF”. Start at the fence directly below the first bolt. Climb the shallow corner to the base of the steep wall. Climb the wall first slightly left between second and third bolts, move rightwards at the third then up and back left to the last bolt, continue up the pink tinged wall on better holds to belay in a shallow pod. Start 2.0m left of the fence directly below the first bolt. Climb the wall to the base of the groove which is climbed awkwardly, at the top of the groove (3rd bolt) move right onto the steep face and continue up to the 4th bolt, on your left, up again to the feminine features before an awkward move right leads to better holds and easier climbing to the belay of “Conundrum”. Start as for Hall Mark past the first two bolts then move left and up in to the groove. Bridge up the groove, above the last bolt step out right on with good holds and move up to the belay of Hall Mark. Start 2.0 metres down and right of the fence line at a short right facing corner. Climb the corner onto the slab and move up to a short rib to the base of the central wall. Climb the centre of the wall on small holds. Start as for Hall Mark past the first bolt then move right and up to the roof, turn it on its right side using small holds. Continue up to a hanging crack with good at the top. Move left to the last bolt of Hall Mark and then up to the belay. This is a great little crag. This is a great little crag. We went on a week night and only climbed three or four routes each as the approach takes about 45min by the time you abseil to the base. I felt as though most climbs were over graded by a grade or two. My thoughts on grades - Rain Dancer ***19, Gas Guzler **18 (sustained, and slightly overhanging but big holds), Night Moves *16-17. Hard to tell, is this fully bolted, or do some routes need gear?